BLACKSBURG (WSLS 10) - The second ice rescue in less than 48 hours sent two people to the hospital Tuesday. The Pittsylvania County Sheriff's Office said crews pulled a man and a woman from a pond Tuesday morning. The rescue happened off of Franklin Turnpike in the Callands area. The male victim was responsive when he was flown to Carilion Roanoke Memorial Hospital. The female victim was unresponsive when she was taken to the Danville Regional Medical Center. Meanwhile in Blacksburg, a brother and sister are recovering thanks to rescuers who pulled them from the Foxridge Pond Monday. The spot is popular for sledding in Blacksburg, but Monday it wasn't the sledding that got some kids into trouble. 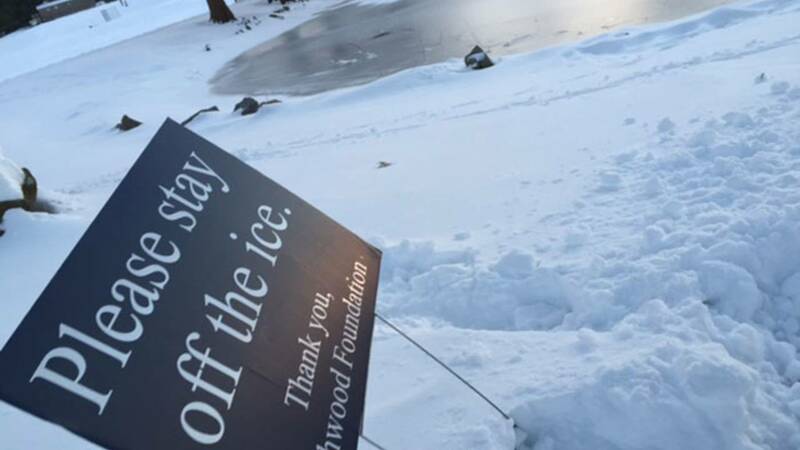 The small and relatively shallow pond becomes dangerous when kids go on it, thinking it's frozen. Lt. Will Bulloss had most of his protective gear on by the time he got to Foxridge pond where the two kids - 12 and 17-years-old - went through the ice and into the water. Blacksburg Volunteer Rescue's Water Rescue Team said the 12-year-old girl went in and her brother went in trying to help her. Both made it out to the island where they waited, soaking wet. Josh Etter was walking his dog when he saw them. He tied his jacket to the dog's leash. The dog helped keep the pair warm until rescue arrived. And not a minute too soon. Lt. Bulloss explained, "We set out some more ropes and got out our stokes basket and rescue equipment and went out to the island." The basket, similar to a sled, helps distribute the load, putting less pressure on the ice, making it less likely to crack. "We used it as a sled to ferry warming equipment out to the patients and to bring the patients back safely to shore," Bulloss said. Rescue crews were able to pull the two to safety, but they suffered mild hypothermia. Crews said no rescue is easy and no one else was hurt trying to save them. It's a reminder of advice those veteran rescuers learned as Boy Scouts. Robert Heins from Blacksburg Volunteer Rescue explained, "The advice is 'reach, throw, row, go.' Reach for a victim. If you can't reach him with your hand, throw him an object you can pull back. If you can't do that get in a boat to go to them and your last option is getting in the water." The good news is those two kids are got to go home a day later and were doing fine. The scary part is - Monday night - more than a dozen people were seen out on that same ice.